White sisal straw button headpiece with blue, red and green acetate palm fronds. Natural pinokpok beret headpiece with matching bow. White and silver mesh fabric button headpiece with natural pinokpok bow. Cream sisal straw button headpiece with natural criss cross hive. Cream and natural two-tone wide brimmed hat with cream filigree braid. 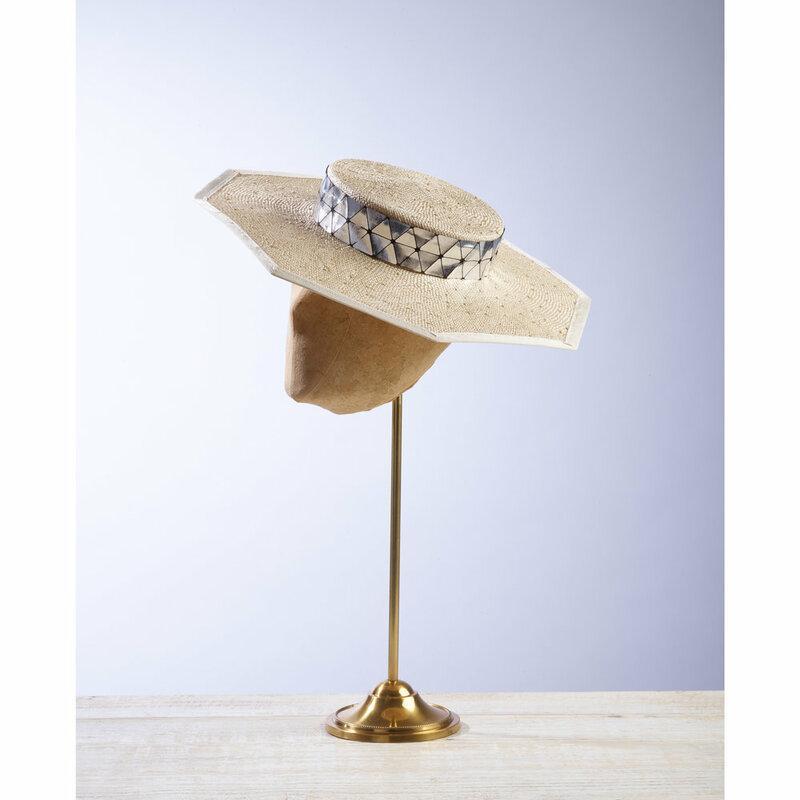 Cream sisal straw button headpiece with matching structural folds. White straw button headpiece with navy pierced straw spray. Cream and neon orange pinstripe pleated headband. Camel, Grey or Black embellished hairband. Natural hemp button headpiece with organic folds and pleats. Black sisal straw button headpiece with matching structural folds. 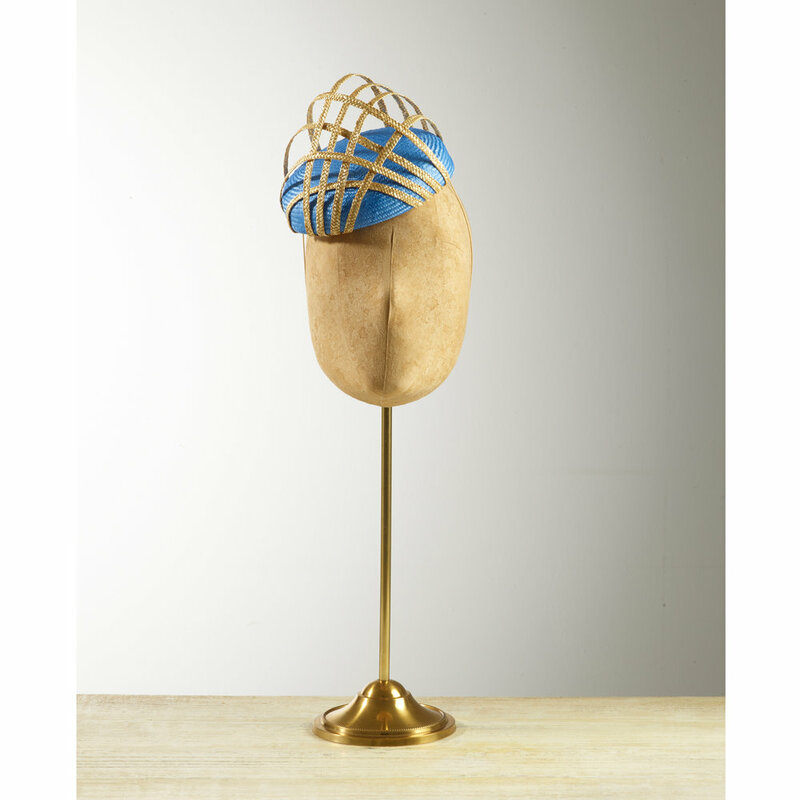 Navy sisal straw button headpiece with wood veneer shards. A fun little classic button headpiece in black with white veiling detail. Pink sisal straw beret headpiece with natural pinokpok bow. Red sisal straw button headpiece with natural pinokpok bow. Cornflower blue sisal straw button headpiece with natural criss cross hive. Navy pierced straw wide brimmed hat with green and cream silk ikat trim. Emerald green sisal straw button headpiece with matching structural folds. Cream pinokpok button headpiece with contrasting navy fabric wave. Cream sisal straw button headpiece with pink sisal straw bow (base not shown). White sisal straw button headpiece with pale pink soft fold. Navy sisal straw beret with contrasting fuchsia pink loops. White button headpiece with pale blue wool felt bow. Pale blue sisal straw button headpiece with abstract neon pink sails. Maroon sisal straw button headpiece with matching soft structural folds. 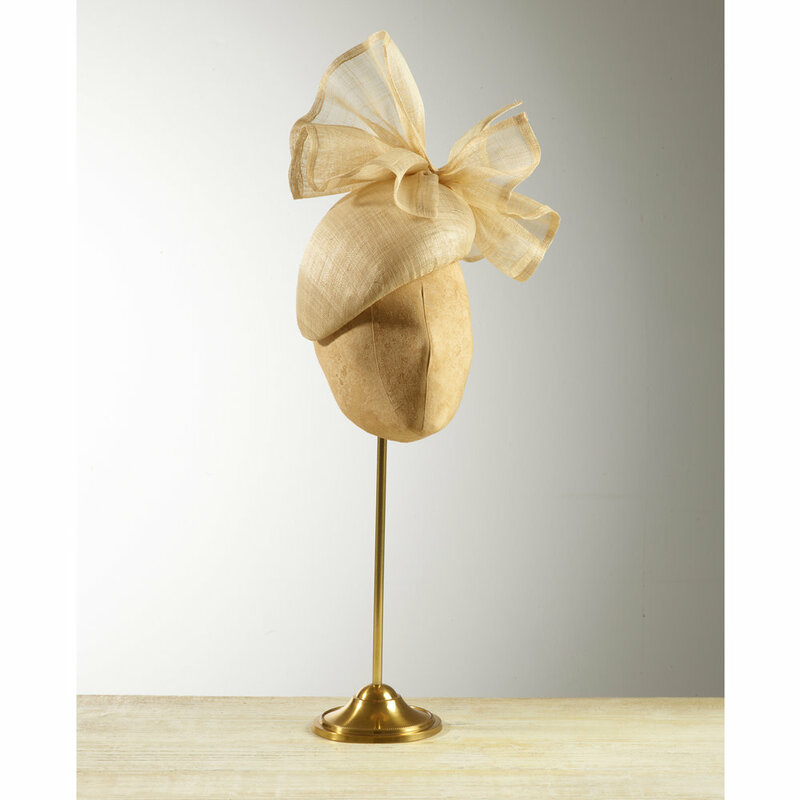 Gold sisal straw button headpiece with matching structural folds. Cream sisal straw beret with matching loops. Black sisal straw button headpiece with cream pinokpok bow. Cornflower blue sisal straw headpiece with contrast off white as the back. Silvery lilac sisal straw button headpiece with mesh copper flowers. Navy silk beret with white veiling and cream sisal straw and silk magenta loops. Pale pink beret in perforated faux leather with matching twist. Royal blue fabric button headpiece with white and silver mesh spray. Navy sisal straw button headpiece with matching navy fabric wave. Cream pinokpok button with contrasting royal blue fabric and abstract yellow wire. Cream and pale pink pierced straw wide brimmed hat with cream braid. Multicoloured button headpiece with ivory wood veneer shards. Pale pink pinokpok beret with pierced straw spray and wood veneer shards. Blue and White silk button headpiece with coordinating twist. Pale blue sisal straw button headpiece with matching structural folds. Cornflower blue sisal straw beret with cream loops. Sisal straw structured folds in cream and silvery lilac attached to a straw disc. Navy sisal straw beret headpiece with Ivory pinokpok bow. Cream knotted sisal straw boater with silvery lilac trim and mesh copper flowers. Cream sisal straw button headpiece with frayed edge red structural folds. Navy sisal straw button headpiece with matching structural folds. Pink fabric beret covered with a white and silver mesh and complimentary twist. Cream sisal straw button headpiece with emerald green pleated folds. Emerald green sisal straw button headpiece with a white and green abstract acetate fan. Cream knotted sisal straw octagon boater with silver and black diamond trim. Navy sisal straw pillbox with dusty rose pierced straw spray & wood veneer shards. Silvery lilac knotted sisal straw button with silvery lilac and cream smooth folds.